I melted a few chocolate chips to use as glue for attaching the M&M wheels to the Milky Way car. I made sure each car had all the same color wheels, and I made sure all the Teddy Grahams were the same shape. To put the Teddy Grahams into the Milky Way, I first cut a little slit before pushing them in. Reason being, the first one that I did (without the slit) caused the candy bar to get slightly crushed from the pushing. I was able to save money by getting my candy at the Dollar General. They have little $1 packs that each have either (6) fun size Milky Way or (6) fun size M&M packs. I bought (2) Milky Way ones and (2) M&M ones (I was worried that I wouldn't be able to get all 10 cars with matching wheels if I only bought (1) of the M&M's - but I ended up only needing one). So for $4, I got all the candy I needed for the price of one big bag of Milky Way. 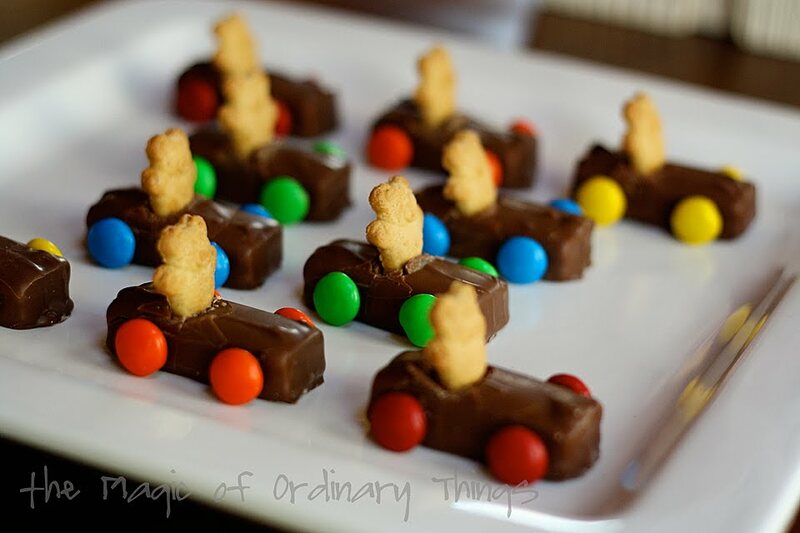 According to Luke's teacher, they were a HUGE hit!! 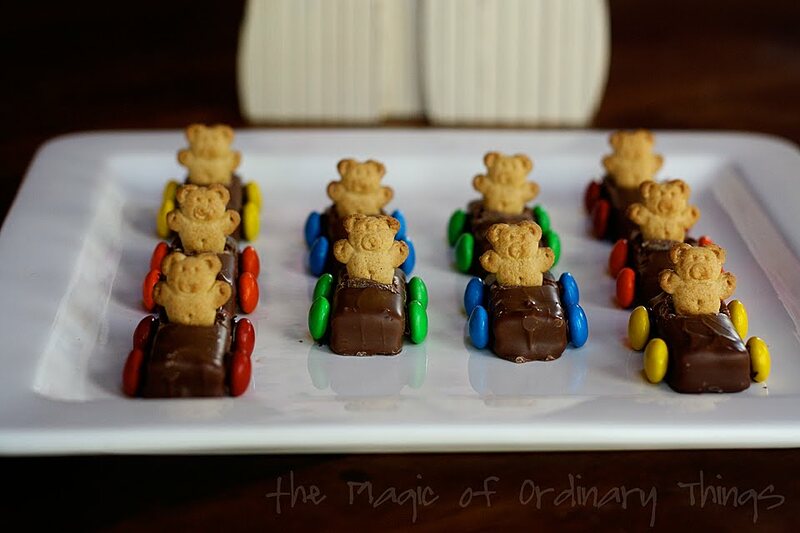 And, since they are so simple, and I know I can get the candy pretty inexpensively, and I usually have chocolate chips and Teddy Grahams on hand, I can make these cute little treats for my boys whenever I want. AND... it's probably something, they can even make themselves. Definitely the best teddy pattern and shape i have seen in ages! Thank you so much for sharing your progress and the finished bear. Great idea; thanks for sharing! 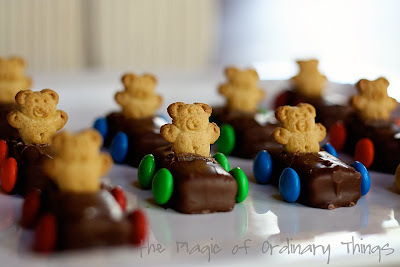 I made your Teddy bear cars for my son's Race car theme birthday. We used a HOT knife to further minimize the cracking of the mini chocolate bars (we used Mars bars) and noticed that our bag of Teddy Grahams had two different shapes. The ones with their legs together fit in much better than those with their legs apart. 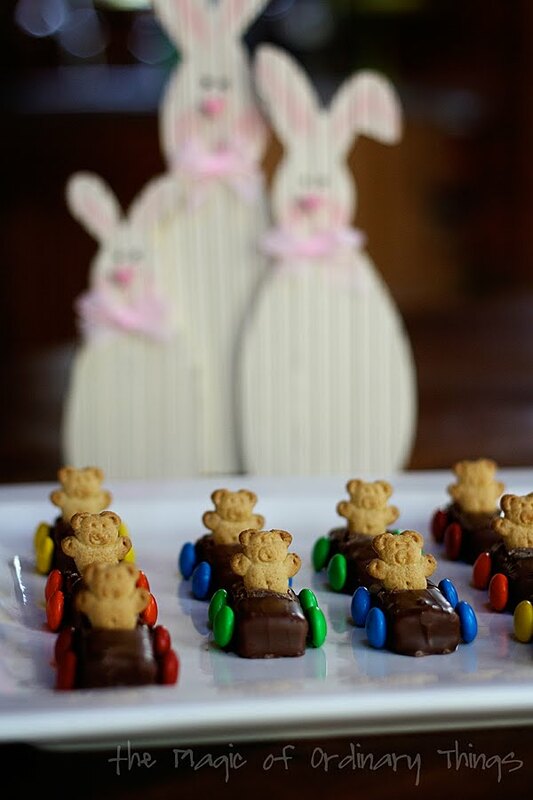 Wow...Awesome looking choco cars.!! I'm definitely going to try this for my lil ones birthday party next week. A small doubt,..can we make this way ahead, like a day before. will the Grahams get soggy if we eep it with the chocolate for long time...!!? ?